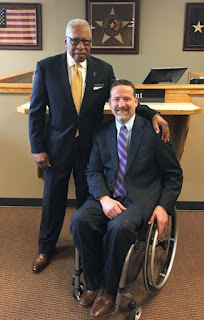 I ran into my friend and fellow defense attorney, John LaGrappe, on Friday in the basement of the parking garage. If you don't know John, he's a big personality and also one hell of a trial lawyer. 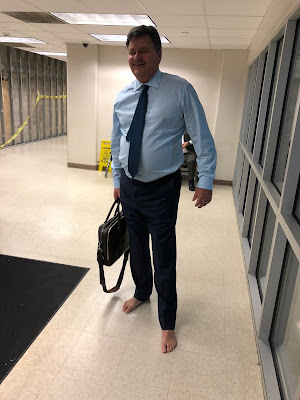 He was in trial on Friday, but had to take his boots off for the metal detector. When he did, all of us in the vicinity got a look at John's lucky trial socks. Who in the hell goes barefoot with boots? As a blogger on serious matters, I generally try to avoid writing funny stories about my kids. Sometimes, I find that unavoidable. 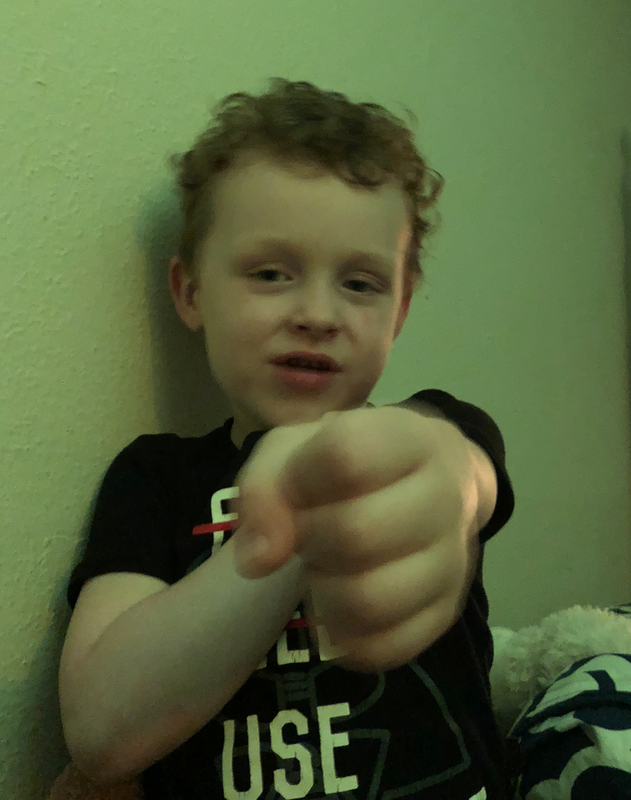 This afternoon, I picked my 4-year-old up from after-school care and his counselor told me that he had gotten into a fight with another 4-year-old. She told me he wasn't in trouble, because he was defending a friend. Naturally, I asked him what happened. SMITH: [Other kid] hit me and pulled my hair. SMITH: I told him that was not acceptable. ME: "Not acceptable?" Who told you to say that? ME: That's very good, Smith. What happened then? SMITH: I punched him in the forehead. The services for our friend, Mark Vinson, have been released. There will be visitation on Tuesday, May 1, 2018 from 5:00 p.m. to 8:00 p.m. at the American Heritage Funeral Home Chapel located at 10710 Veterans Memorial Drive, Houston, TX 77038. A Celebration of Life will be held at the same location on Wednesday, May 2, 2018 from 2:00 p.m. to 3:00 p.m. with a Repass from 3:00 p.m. to 5:00 p.m. The CJC Community was shocked and saddened yesterday to learn of the unexpected passing of longtime former-prosecutor and defense attorney, Mark Vinson. It is no exaggeration to say that Mark was an icon at the courthouse who was very loved and respected. He was 79 years old. Mark was a Vietnam veteran who served in the United States Army, before retiring as a Major. He then attended law school and joined the Harris County District Attorney's Office in 1983. During his lengthy tenure at the D.A. 's Office, he served as a teacher and mentor to many prosecutors for several decades, and he was known for being a skilled trial lawyer. Mark was also highly regarded as a fair, honorable and friendly prosecutor. After his retirement from the D.A. 's Office in 2005, he practiced criminal defense and was an adjunct professor at Texas Southern University's Thurgood Marshall School of Law. Mark never stopped mentoring younger lawyers. I never had the pleasure of being directly supervised by Mark, but I knew him and highly respected him. He was a classic example of the gentleman lawyer who represented everything good about there was about our profession. He defined collegiality and believed in fighting hard in the courtroom, but respecting your opponents outside of it. Everyone he saw, he greeted with a smile and a firm handshake. Mark's passing was a tremendous shock to all of us because he was the picture of health. I saw him last week, and he didn't appear to have aged a bit. Quite frankly, I was shocked to read that he was 79. I thought he was younger than that. Former Harris County prosecutor and 9th District Court Judge Phil Grant saw Mark in his court in Montgomery County and posted this picture. Mark's obituary can be found here. He lived an amazing life. As of this writing, I do not know about his funeral arrangements. I will post them as soon as I know something. My condolences go out to Mark's family. I hope they know that he was a very loved and respected member of our courthouse family, as well. Yesterday, the lawyers that practice in and around the Harris County Criminal Justice World were all abuzz about the attack on Danny Lacayo by one of his clients, Luciano Olivarez, during the felony male jail docket. Danny is a very well-liked colleague who is highly respected by judges, prosecutors and his fellow defense attorneys. We were all very relieved to know that his injuries were not serious and we hoped that the incident might lead to some changes in the way the jail dockets are handled. The focus of yesterday's incident shifted slightly in the afternoon when the Houston Chronicle published an article by Keri Blakinger about the incident. Although the PD's Office and Danny had not given a statement for the article, the president of the Harris County Deputies Organization Union, David Cuevas, was apparently more than happy to talk. 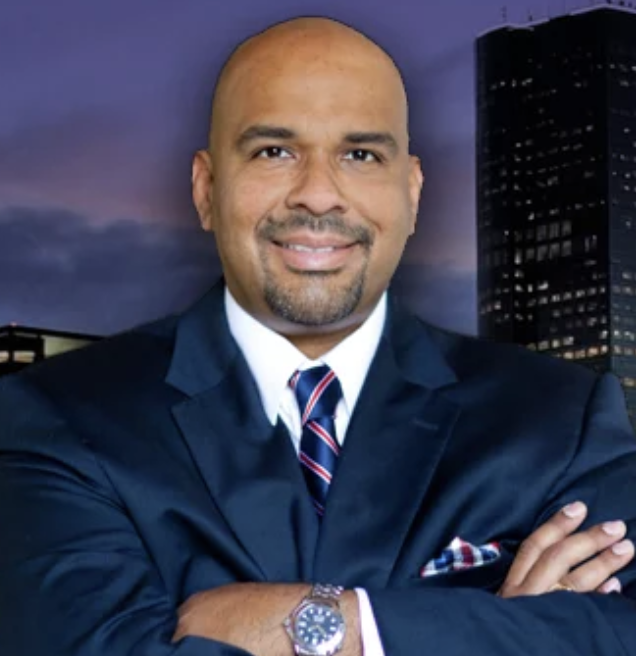 In response to learning that the Harris County District Attorney's Office had filed felony charges of Assault on a Public Servant against Olivarez, Cuevas "questioned whether prosecutors would have filed similar charges in the case had a jailer or deputy been the target." "Our union will be monitoring the district attorney's office as to whether or not they'll be accepting charges when this happens to other public servants that are not public defenders," said union president David Cuevas. "We want to make sure that there is not a double standard." Cuevas's statement was laughable for a host of reasons. First off, I'd like to know exactly what "monitoring the district attorney's office" means to him. Was he planning on setting up shop at D.A. Intake to monitor all incoming calls? Second, the very idea that the D.A. 's Office under Kim Ogg (or any of her predecessors, for that matter) is reluctant to file Assault on a Public Servant charges on behalf of police officers is absurd. Those cases are filed every single day at a very high frequency. Cuevas might as well have questioned whether or not the Ogg Administration was still accepting charges on murder cases. Police officers and jailers have dangerous jobs that lead them into dangerous interactions with suspects. Nobody has ever disputed that. When a suspect reacts violently and attacks a police officer or jailer, those charges get filed. Period. I've seen charges of Assault on a Public Servant filed against people for punching an officer in the bulletproof vest. I've seen mentally ill suspects who were flailing their arms get charged if they made skin to skin contact with a police officer. Trust me when I tell you that in almost 19 years of practicing in the CJC, I've seen the word "assault" stretched to some pretty great lengths when it comes to public servants. In my time, I've seen hundreds, if not thousands of Assault on a Public Servant charges filed against people who have attacked police officers and jailers. This is only the second incident I remember charges being filed where a defense attorney got attacked. Cuevas's statement implying that somehow the D.A. 's Office prioritizes the safety of defense attorneys over the safety of police officers and jailers was just silly. Prior to the damage caused by Hurricane Harvey, each court in the Harris County Criminal Justice Center held a docket every day of the work week. These dockets were (obviously) held in normal courtrooms, where there were holdover cells for the incarcerated defendants. Attorneys who were speaking with their "in custody" clients, did so through glass partitions. If a defendant was brought out of the holdover into the courtroom, they were handcuffed. 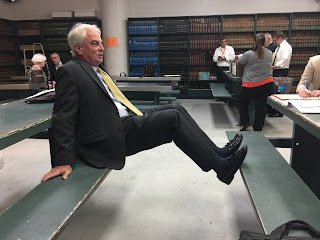 If a defendant had acted with particular aggressiveness, they might find themselves in leg restraints before being allowed outside of the holdover. After Hurricane Harvey rendered the CJC unusable (yet again), one of the biggest challenges facing the Harris County Criminal Justice System was determining how to get incarcerated inmates their day in court. There were rules and regulations that had to be followed. Locations had to be secure and there had to be adequate personnel to guard the inmates. The Civil Courthouse was fine for defendants who were out on bond, but it was not equipped to handle inmates. There are no holdover cells attached to a civil courtroom. Ultimately, it was decided that the vast majority of the "in custody" cases would have to be held at the actual jail. The female felony jail docket is held daily on the 4th floor of the Harris County Jail located at 1200 Baker Street. The misdemeanor jail docket is held across the street in "Little Baker." The felony dockets for incarcerated males are held in the basement of the Harris County Jail located at 701 N. San Jacinto. While the female and misdemeanor dockets are generally pretty safe occasions, the felony male dockets are a completely different story. The felony male dockets are a disaster waiting to happen, and lawyers who practice there got a small taste of that danger this morning. To understand what happened today, one must understand the layout of the basement of 701 N. San Jacinto, as well as the procedures followed for each docket. Each weekday, the 22 District Courts, as well as the Reintegration Court, take turns having a jail docket for male inmates with charges pending out of the respective courts. Two courts will hold a docket in the morning and two will hold a docket in the afternoon. Based on the normal cycle, this allows each court to have a jail docket every six business days. In the basement, there are essentially four rooms used by the lawyers and court personnel. Two of those rooms function as actual courtrooms, where lawyers can approach the judge, and defendants can be brought for pleas (or any other matter requiring judicial attention). The third room, held in 701's infamous law library, is where prosecutors bring their files and meet with the defense attorneys. This place can look like Grand Central Station during a busy docket. Attorney Vic Wisner, exercising in the Law Library. The fourth room is where attorneys and their clients meet to discuss cases, and that's where things get dangerous. The attorney-client meeting room holds roughly around thirty male inmates. It is actually a converted "pod" with two tables placed inside of it so that inmates can do paperwork, if need be. Around the perimeter of the room are plastic chairs for the inmates to sit in while they wait to talk to their attorneys. The room is extremely overcrowded. None of the inmates in the room are secured by handcuffs or leg restraints. Although they are all told to sit down and wait for their attorneys to come speak with them, there are no physical restraints on them. There is nothing there that would prevent them from getting up and walking across the room. There is nothing there to prevent them from fighting with each other. There is nothing there to prevent them from attacking one of the lawyers who enters the room. The deputies who are in charge of securing the inmates, sit in chairs outside of the meeting room. In short, it is a windowless room with one door for an entryway. It is filled to capacity with inmates charged with felonies ranging from theft to drugs to sexual assault to murder. And every day, civilian attorneys wade into this room, filled with inmates, with the hope that none of the inmates feel like attacking anyone. The potential for something terrible happening is tremendous. It only continues to operate under the optimistic belief that each and every one of the inmates will follow all of the rules and not lose their temper. But, here's one thing you quickly realize when you become a defense attorney -- you often find yourself being the messenger of very bad news. Whether it is telling the client what the evidence is against him or just conveying the plea bargain offer from the prosecutor, defense attorneys have the unpleasant duty of upsetting their clients on a daily basis. The vast majority of those clients take the news in stride and understand that is how the System works. Others don't. Some will become quite angry over the news they receive. Some will lose their minds simply over the length of a reset. Oh, and did I mention that a decent amount of the inmate population in the meeting room has some level of mental illness? Today, a mentally ill inmate attacked Public Defender Danny Lacayo in the holdover. Danny had just told his client that his case was going to be reset and placed a pen on the table for the client to sign his paperwork. The client became very agitated and Danny quickly picked up the pen, moving it from his client's reach. The client then punched Danny in the face. Fortunately, Danny is a pretty stout guy. He stood up and walked out of the room before the situation escalated further. He said the punch hurt, but mostly he was relieved that he had the wherewithal to move the pen. Ultimately, someone told the deputies outside the room what had happened and they removed the defendant from the meeting room. The situation could have been far more tragic. To my knowledge, this is the first physical assault on an attorney in the meeting room, but there have been several close calls. Earlier this week, a male inmate began losing his temper with his female attorney. She was able to escape the room before it turned physical. Every lawyer that works a jail docket worries about what would happen if the situation truly got out of control. It will get out of control one day. It isn't a matter of "if." It's a matter of "when." The quarters are too close. There are no safety protocols. The jail is understaffed. The inmates are angry. The whole situation is a powder keg, waiting to explode. There will be a portrait unveiling for former Judge of the 228th District Court and Current United States Representative Ted Poe on Friday, April 20, 2018 at 11 a.m. The event will be held on the 17th Floor of the Civil Courthouse in the ceremonial courtroom. The address for the courthouse is 201 Caroline, Houston, TX 77002. Judge Poe is a legendary part of the Harris County Criminal Justice System both as a prosecutor and later as Judge of the 228th. I am very proud to say that I tried my first murder case in front of Judge Poe and I still have the souvenir he gave me when the trial was over: a note from the jury requesting to hear the prosecutor's argument again. 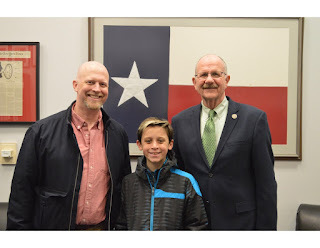 Even though I hadn't talked to Judge Poe in years, he was nice enough to get tickets for me and my son to tour the United States Capitol last Spring Break. It was great to see him. Whether you practiced in front of him or not, I highly encourage you to attend Friday's unveiling. Judge Poe truly is a legend and an icon of Harris County History. You might actually hear a good War Story or two, as well.